Both get a searing look at a world of problems out there. 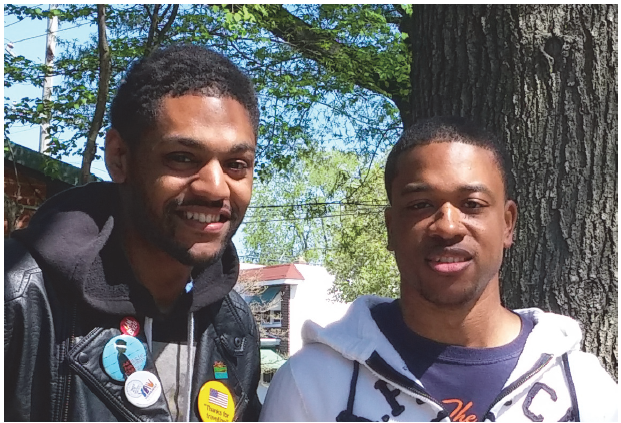 Kameron Gibbs and Darren Davis, members of the Chester Eastside, Inc., Board, recently attended a national conference on “Breaking the Chains: Mass Incarceration and Systems of Exploitation,” on behalf of Chester Eastside. What they heard in those few days — often from the victims themselves — was a litany of the kinds of suffering that is the everyday experience of many people both in America and around the globe. Now they want to share what they learned with fellow Board members in hopes that Chester Eastside can find ways of addressing these problems as they get played out in Chester and beyond. Having grown up in Chester, the two Board members are not strangers to the challenges of life in urban America. But still, “I found it shocking and surprising,” said Kameron Gibbs, who will be doing graduate studies at Capella University in his chosen field, child psychology. “I realized this could be happening to me.” Already he’s thinking of ways to use what came out at the conference in programs at Chester Eastside. A woman’s account of what she went through in prison after being convicted of a minor offense; the stories of life in refugee camps in the Middle East: These are the kind of thing s that come back to haunt one long after an event is over. As Kameron Gibbs and Darren Davis share these and other gleanings from “Breaking the Chains” with Board, staff and volunteers at Chester Eastside, it’s hoped that they, too will be spurred to action.